Motherwort is a member of the mint family and while native to Europe it has crossed over the Atlantic and set up life as a weed in some parts of North America. Motherwort, as suggested by its’ name, is indicated for use with the uterus and with motherhood. Herbalist Susun Weed suggests that motherwort tincture will provide fast relief for menstrual cramps when taken 5-10 drops at a time, at the first moment of pain and taken thereafter every 15 minutes as needed. Motherwort tones the uterine muscle and will eventually diminish cramps within four months. Motherwort is also an ally to menopausal women and can help with hot flashes, water retention and mood swings. Motherwort also has an affinity to the heart, as suggested by part of its latin name “cardiaca.” It is used as a heart tonic, and in particular for nervousness with heart palpitations. The acrid bitterness of motherwort may calm the sympathetic nervous system and aid with nervous restlessness, wakefulness, disturbed sleep and anxiety. The use of motherwort tincture during these moments may help relieve nervousness. A dose of tincture 10 – 20 drops taken several times a day can lower blood pressure and strengthen electrical activity in the heart. Daily use may help new blood vessels grow to the heart. 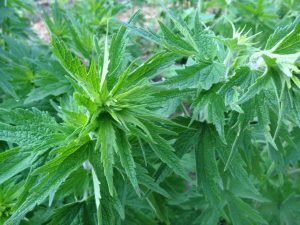 Susun Weed also recommends motherwort as a pain reliever and useful in your herbal first-aid kit. Motherwort can reduce lower back pain, fibromyalgia, and chronic fatigue with 10-20 drops of tinctures, every 15 minutes until relief sets in. Motherwort should not be used during pregnancy. Excessive use may interfere with other cardiovascular treatments. Dry the plant and use for infusions (1-2 teaspoons dried herb, steeped for 10-15 minutes) or make a fresh-herb tincture in high proof vodka. Matthew Wood recommends smaller doses of the tincture, while Susun Weed supports more hearty quantities. Around 75% of menopausal women experience hot flashes. This infusion seeks to normalize the body’s response to these experiences and help to ground a woman having a hot flash. Combine the following: 2 parts motherwort, 2 parts black cohosh, 2 parts sage, 1 part blue vervain, 1 part chaste tree berry and mint to taste. Use 1 teaspoon of herbs per cup of water and let steep for 30 minutes. Strain and drink in ¼ cup doses throughout the day, up to 3 cups. Combine 2 T dried hawthorn flowers, leaves or berries, 2 T dried peppermint and 1 T dried ginkgo leaves in a 1-quart glass jar. Pour enough boiling water over them to fill the jar. Steep for 8 minutes. Add 1 t dried motherwort and 1/4 t dried yarrow leaves and steep for an additional 2 to 3 minutes but no longer, as these herbs are quite bitter. Strain the liquid and sweeten to taste with honey, stevia or maple syrup. Drink as desired. Contraindications: Not to be used for bowel complaints with inflammation – pain on pressure, tongue dry, with reddened tip and edges (Matthew Wood). The tea and tincture are safe for general use but overindulgence can cause stomach aches. As a tincture: Combine 2 teaspoons dried alfafa leaves, 2 teaspoons dried nettle, 1 teaspoon motherwort and cover with 1/2 cup vodka or brandy. Steep for a month before straining. Use 10-25 drops in a cup of warm tea and allow time for the alcohol to evaporate before drinking. Cautions/Contraindications: Do not use during pregnancy.